Every wonder what heaven would taste like? I think these are pretty close!! I saw these a while back and added them to my Pinterest board waiting to work up the courage to make them. I had no idea that they were made by someone that I have been admiring on Instagram. So when I realized it, I was even more excited to give them a try. I will have to say, that I got over zealous and wanted to bake all of the rolls at the same time. However, I should have followed the directions and baked what fit in a 9×13 pan. Instead I tried to bake all of them on a cookie sheet. So learn my mistake. It took FOREVER to cook the rolls that were on the inside. The ones on the outside were perfect. So… stick with the instructions and bake in a 9×13 pan! You won’t be disappointed. I’m looking forward to baking these again!!! Add yeast to the 1 cup of lukewarm water and stir with a spoon, set aside for about 5 minutes. In the bowl of a stand mixer, add shortening, sugar, and salt to hot water and beat for 30 seconds. Let cool to lukewarm temperature. Stir in 2 cups of flour and mix until smooth. Add yeast mixture and mix until well combine. Gradually stir in the remaining flour and mix with the dough hook for about 2 minutes. Remove dough from the bowl and place on a lightly floured counter. Knead by hand, add a little flour if the dough is still sticky. Knead until dough feels satiny and smooth. Put the dough in a greased bowl and cover with a towel. Let rise for 30 minutes or until dough doubles in size. Remove dough from bowl and place on a lightly floured counter. With a rolling pin, roll one half of the dough into a rectangular shape. Spread dough evenly with 4 tbsp of softened butter. Sprinkle dough with 1/4 cup brown sugar. In a medium bowl, carefully stir together the frozen raspberries, sugar, lemon zest, and cornstarch. Sprinkle half the raspberry mixture over the dough. Gently roll up dough into one long roll. Cut rolls, using a piece of dental floss or thread, about 2 inches thick. Place rolls into a greased 9×13 baking pan. Now follow the exact same steps with the other half of the dough, using the remaining ingredients. Place the rolls in a warm spot and cover with a towel. Let rise until double in bulk, about an hour. Bake rolls at 425* for about 10 minutes. Reduce the temp to 350* and bake for another 7-10 minutes or until golden brown. If the tops are browning too much and the centers aren’t done, you can cover with foil and bake for a few more minutes. Remove pans from oven and let cool on a wire rack. In a medium bowl, combine cream cheese, butter, powdered sugar, and lemon zest. Using electric mixer, beat until smooth. 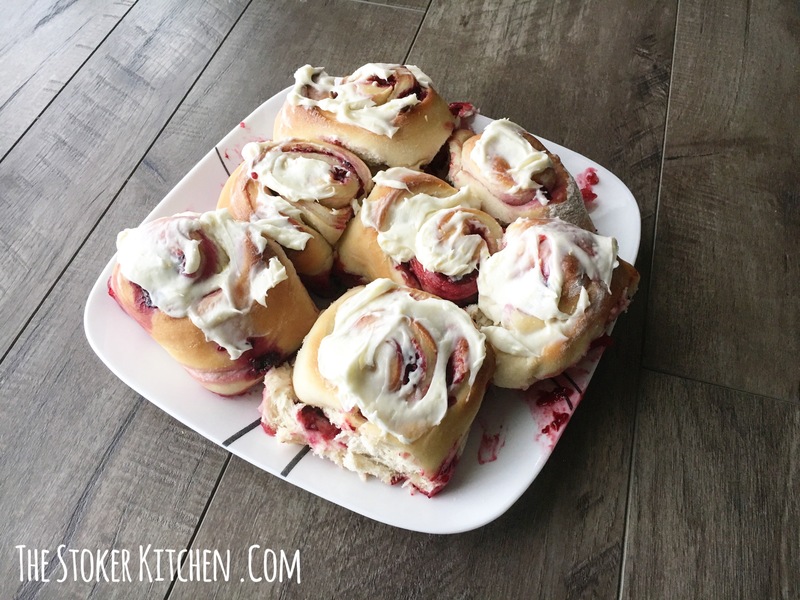 Spread frosting on rolls and serve.